The Reactive Skin Decontamination Lotion (RSDL) is a Joint Program consisting of decontaminant(s) and applicator(s) required to immediately reduce morbidity and mortality resulting from Chemical, Biological, Radiological, and Nuclear (CBRN) contamination of the skin. The Food and Drug Administration (FDA) in 2003 cleared for use by the U.S. military a liquid decontamination lotion intended to remove or neutralize chemical warfare agents and T-2 fungal toxin from the skin. The lotion, RSDL, must be applied to exposed skin as soon as possible after exposure to a chemical agent. The lotion is impregnated in a sponge pad packaged as a single unit in a heat-sealed foil pouch. When exposed to chemical warfare agents, the user wipes the exposed skin with the lotion. The lotion removes the agents or the T-2 toxin and also reacts with the chemical agents, rapidly neutralizing them so they are non-toxic. 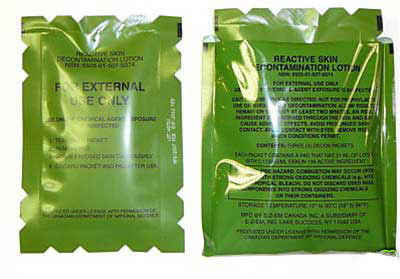 "If used in time, this lotion can help prevent the serious burns and deaths that results from exposure to chemical warfare agents," said FDA Commissioner Mark B. McClellan, M.D., Ph.D. "FDA worked with the U.S. Army to expedite review of this product to make it available to our men and women in uniform as quickly as possible." FDA cleared the lotion for use based on studies conducted by the U.S. Department of the Army that showed it is safe and effective. The Army tested the product's safety by conducting skin irritation, sensitization and photo irritation studies in more than 300 people. It tested its effectiveness by using it to treat animals that had been exposed to chemical agents. The Canadian military and the U.S. military worked together to develop the scientific data on which FDA based clearance of the product. RSDL is manufactured by O'Dell Engineering Ltd/E-Z-EM Canada Inc., Canada. RSDL is manufactured by O'Dell Engineering Ltd/E-Z-EM Canada Inc., Canada. It was invented at the Ottawa Laboratory of Defence Research and Development Canada and developed at that institution’s Suffield Laboratory with support from the Department of Defense for licensing the product in the U.S. It is also manufactured by Bracco Diagnostics, Inc.
Decontaminate and applicator to immediately reduce morbidity and mortality resulting from Chemical, Biological, Radiological, and Nuclear (CBRN) contamination of the skin. U.S. Army Issued, date of MFR is Feb 2007. Use only as directed. Not for prophylactic use or whole body decontamination. Please refer to package label for warnings and instructions of use. *RSDL can be absorbed through the skin and may cause adverse effects. Avoid prolonged skin contact. Remove by rinsing when conditions permit. Avoid direct contact with mucous membranes.